NOTES: Treat as a short run kit. A member of the second generation of Russian aircraft designers, and best known for fighter designs, Alexander S. Yakovlev always retained a light aircraft design section. In May 1945, Yakovlev initiated design of the Yak-18 two-seat primary trainer. He designed it to replace the earlier Yakovlev UT-2 and Yak-5 in service with the Soviet Air Forces and DOSAAF (Voluntary Society for Collaboration with the Army, Air Force and Navy, which sponsored aero clubs throughout the USSR). The new aircraft flew a year later, powered by a Shvetsov M-11 five-cylinder radial engine and featuring a retractable tail wheel landing gear. The design proved exceptionally easy to build and maintain, and it continues in production today, 55 years later, in two of its many variants, the four-seat Yak-18T and two-seat Yak-54. The CJ 6a, produced in China, is sometimes quoted as a variant but is a completely different aircraft but uses some Yakovlev features such as the undercarriage from the tricycle version of the Yak 11. 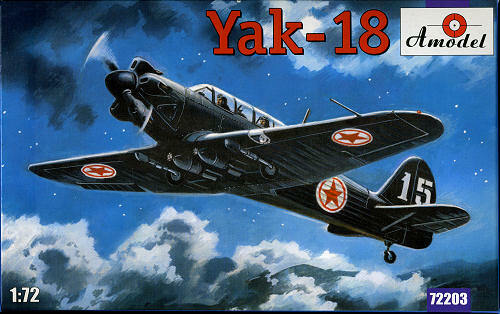 The subject of this kit is one of the early Yak-18 trainers that were ubiquitous throughout the Soviet-influenced block of nations from Afghanistan to Zambia, and served with the North Korean/Chinese air force during the Korean War as a night nuisance bomber. 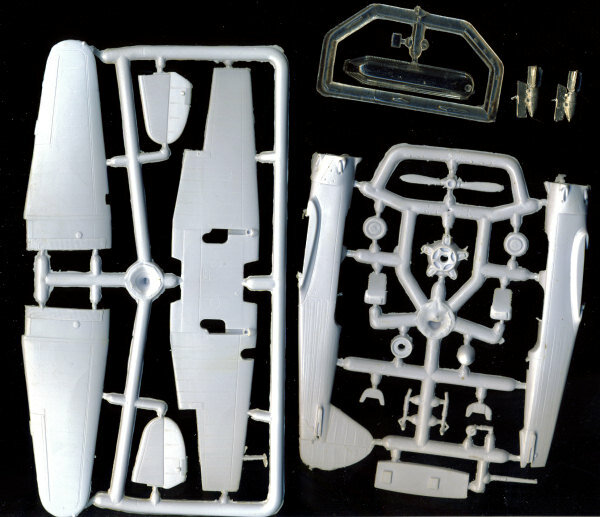 Molded in a light grey plastic with thick sprues and rather thin sprue gates, this is very much typical of the A-model kits I've built in the past. Surface detail is well done with engraved lines and subdued fabric representation. The somewhat soft plastic means that care will be needed when removing the smaller parts. I found the usual flash on nearly all the parts but nothing major and typical of low pressure molding. The single transparency is thick and has somewhat indistinct canopy frame lines. Unlike the earlier boxing, this one has plastic bombs instead of the cast metal ones and the detailing on these seems to be a bit better. The cockpit is very basic consisting of a floor, two seats and two instrument panels. No control sticks or sidewall detail or rudder panels. However, not much detail will be visible through the rather thick transparency. One thing I did find that was rather cool is that the elevators are slightly deflected downward with the trim tabs correctly deflected up a bit. Can't think of many other kits that provide this. The instructions just show a general area for placement and it appears they are to be mounted under each of the wing roots. Markings are provided for four aircraft. One in Dark Green over Light Blue and another in overall Black for the North Korean AF. The reason for the 12 roundels is that one is a stencil variety. There is another for the Polish Air Force with civil registration (which may have been required on training aircraft), and one for the USAF, all from about 1950 if I read the cryptic '50th' commentary for each markings option correctly. I'm not sure just how opaque the markings are, but have found previous A-model kits to have usable decals. Instructions are quite usable and well drawn. The plastic in this kit is nearly identical to a previous release of this kit. Even two of the markings options are the same. Where this one differs is the option of US and Polish AF markings and the plastic vice rather crude metal bombs. The Yak-18 was flown by a number of Soviet bloc countries so the variety of insignia that can be used on this kit is large. Though a simple kit, I've found out that when it comes to low pressure molded kits, they can be a bit of a challenge so recommend that the builder have some short run plastic experience before tackling this one. The end result should be a cool little kit and one that fits well in any Korean War collection. Thanks to www.scale-model-kits.com for the preview kit.